Patta Village. 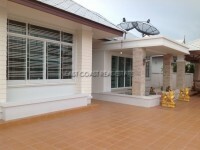 This secure modern estate is located just off of Siam Country Club road in East Pattaya. This I village has proved extremely popular with both Ex Pat families and affluent Thais alike. The area is well known for its International golf courses and choice of International schools is the area. Commuting to one of the many industrial areas close by such as Amata, Laem Chabang, and Rayong is also very easy with major motorway and highways within easy reach. This modern 3 bedroom villa is positioned next to the communal swimming pool and gymnasium so really makes this a ‘stand out property’. As you enter the home there is a nice landscaped garden which can be accessed from either the living room, dining room, or at the rear beyond the kitchen. Behind the property next to the kitchen door is an outdoor Thai kitchen. The living room is very bright with high ceilings with extra skylights which create a great feeling of space. There is a high quality fitted European kitchen with a breakfast bar and an open plan dining area to the far corner of the home, plus a pantry and guest bathroom. The master bedroom benefits from a private en-suite bathroom and walk in wardrobes, and the extra 2 guest bedrooms share another modern bathroom. The village has key card entrances and ample security guards. There is a large communal swimming pool, gymnasium, children’s playground and plenty of entertaining spaces. The title deed is held in a Thai name with all taxes and transfer fees shared equally 50/50 between buyer and seller. Living area : 208 sqm.